Food safety happens. But, so does food prevention. That’s why today’s cold food processors are installing technologies designed to help them produce safer food. Enter photohydroionization (PHI) technology, an all-natural oxidation technology that acts as an additional strategic intervention for trimmings and whole muscle. The PHI technology allows for the anti-microbial treatment of meat products without leaving chemical residues. 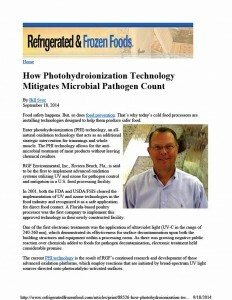 RGF Environmental, Inc., Riviera Beach, Fla., is said to be the first to implement advanced oxidation systems utilizing UV and ozone for pathogen control and mitigation in a U.S. food processing facility. In 2001, both the FDA and USDA/FSIS cleared the implementation of UV and ozone technologies in the food industry and recognized it as a safe application for direct food contact. A Florida-based poultry processor was the first company to implement this approved technology in their newly constructed facility. One of the first electronic treatments was the application of ultraviolet light (UV-C in the range of 240-260 nm), which demonstrated its effectiveness for surface decontamination upon both the building structures and equipment within a processing room. As there was growing negative public reaction over chemicals added to foods for pathogen decontamination, electronic treatment held considerable promise. The current PHI technology is the result of RGF’s continued research and development of these advanced oxidation platforms, which employ reactions that are initiated by broad-spectrum UV light sources directed onto photocatalytic-activated surfaces. The concept behind PHI is to utilize the efficiency of radiation without the traditional problems associated with penetrating radiation such as x-rays and gamma rays and without piercing the packaging or food surfaces. This is an advantage when treating meats prior to grinding, since most meat contamination is on the surface and the grinding operation mixes any surface contamination throughout the product. Aside from ground products, surface contamination is a major concern among food processors. Whole muscle meat and poultry bacteria contamination is virtually always found on the surface. Meat with microbial contaminants inside the fiber should not make it to the processing facility in the first place. A combination of ozone decomposition reactors, hydrogen peroxide decomposition reactors, multi-cell reaction chambers, thin film reaction chambers, various photocatalyst coating chemistries, sonolysis reactors and both single and multi-wavelength UV sources work by using photocatalytic reactions that occur on the catalytic surfaces within the reaction cells, as well as photocatalytic reactions that take place within the air space inside the cell (referred to as photohydroionization). These reactions propagate additional advanced oxidation reactions, including the photo-decomposition of reactive oxygen species, hydroxyl radical formation, the propagation of ozonides and superoxides, as well as the targeted formation of vaporized hydrogen peroxides from water vapor. These reaction pathways typically involve water dissociation (OH radical formation) with subsequent formation of hydrogen peroxide as the result of the hydroxyl radical formation/decomposition reactions. The current reactors use their multi-UV wavelength approach (broad spectrum UV emitters) combined with specific geometries for their catalyst support structures, as well as specialized catalytic substrates (expressly engineered to be highly hydrophilic in nature). By actively drawing H2O onto the catalytic beds themselves, higher hydrogen peroxide production levels are achieved. The implementation of the PHI technology into any and/or all portions of the food supply chain has proven to greatly mitigate the microbial pathogen count that causes both food contamination and spoilage. Furthermore, by applying PHI technology and reducing spoilage, cold food producers will gain a competitive edge in supplying a superior product with a longer shelf life. Bill Svec is vice president of water and food products for RGF Environmental Group, Riviera Beach, Fla.